It begins in 1928 when my Great Grandfather and Great Grandmother emigrated from Poland and settled in downtown Toronto, Ontario. 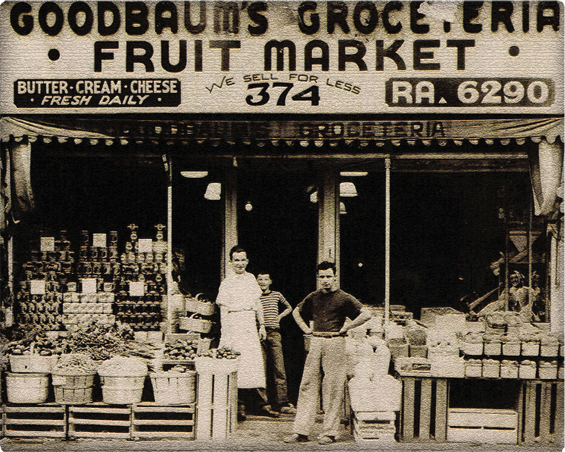 They struggled like many other families before them, but hard work and perseverance made it possible to open up their first grocery store in 1931. The store located at 374 College Street in Toronto, Ontario was one of the first to offer refrigerated products which was a new concept back then. It was also one of the first stores to be a “one-stop-shop”. Previously, it was common place to have to go to multiple places to be able to do your grocery shopping because each store was so specialized (e.g. dairy store, produce store, butcher shop, dry goods store, etc.). The whole family worked together to make the business a success. My Grandfather learned from his father how to shop for the highest quality produce at the Ontario Food Terminal and the outdoor Farmer’s Market. Getting the best deals and offering the best prices often meant getting up before sunrise 12 months a year and working long into the evening. They expanded, grew and became innovators in the industry. Over the years the changing market conditions and demographics took its toll and the business closed its doors while I was still in elementary school. Throughout high school, I worked in a number of different grocery stores but never thought about opening one of my own, until a dinner conversation back in 2004 sparked my interest. A summer working at an outdoor organic market that I helped organize made me realize how overpriced healthy food options were and so…the mission statement of the Organic Garage was born! I knew that with a smart buying strategy, it was possible to offer customers the opportunity to buy organic and all natural products for less money, than they were used to paying. With the help of my Mother and Sister, we opened our first store in Oakville, Ontario in 2006 and we haven’t looked back. When you come into Organic Garage you can see the large picture showing my Grandfather and his two Brothers standing in front of their College Street Store. It is hung in a prominent place as a reminder of what hard work and perseverance can achieve.